U.N.: End Greenhouse Emissions By 2100 Or Risk 'Irreversible' Damage : The Two-Way A new report says that if human-produced, heat-trapping gases aren't phased out by the end of the century, there will be "severe, pervasive and irreversible" consequences. 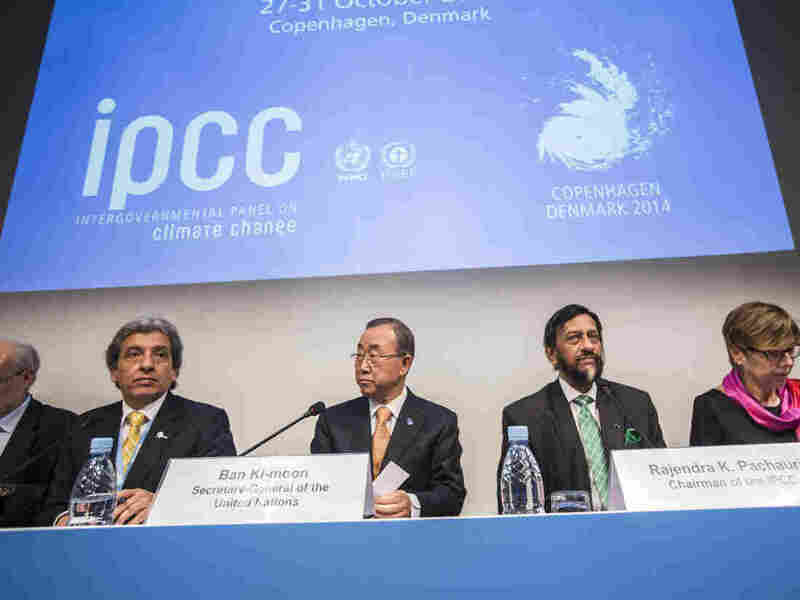 Manuel Pulgar-Vidal, Peru's Minister of Environment, U.N. Secretary-General Ban Ki-moon, Intergovernmental Panel on Climate Change (IPCC) Chairman Rajendra Pachauri and Renate Christ, Secretary of the IPCC present the Synthesis Report during a news conference in Copenhagen on Sunday. A new United Nations report is warning that fossil fuels must be entirely phased out by the end of the century in order to avoid dangerous and irreversible damage to the Earth's climate. The Intergovernmental Panel on Climate Change (IPCC) says the world faces "severe, pervasive and irreversible" consequences if greenhouse gas emissions are not cut to zero by 2100. Examples of "irreversible" change include a runaway melt of the Greenland ice cap that would trigger devastating sea-level rise and could swamp coastal cities and disrupt agriculturally critical monsoons. "Continued emission of greenhouse gases will cause further warming and long-lasting changes in all components of the climate system, increasing the likelihood of severe, pervasive and irreversible impacts," the report says, adding that some effects of climate change that have occurred already will "continue for centuries." "Science has spoken," U.N. Secretary General Ban Ki-moon said, presenting the IPCC's Synthesis Report. "There is no ambiguity in the message," he said. "Leaders must act, time is not on our side." Acting quickly, he said, the problem could be tackled at a reasonable cost. The U.N.'s goal is to limit average temperature rise to 3.6 degrees F above pre-industrial times. Temperatures are already up by 1.4F. "The report is the distillation of a five-year effort to assess the latest evidence on climate change and its consequences, from direct atmospheric measurements of carbon dioxide to thousands of peer-reviewed scientific studies. The final document to emerge from the latest of five assessments since 1990, it is intended to provide a scientific grounding for world leaders who will attempt to negotiate an international climate treaty in Paris late next year. "While the IPCC is barred from endorsing policy, the report lays out possible scenarios and warns that the choices will grow increasingly dire if carbon emissions continue on their current record-breaking trajectory." Despite continued skepticism over climate change among the general public, politicians and business, an overwhelming number of scientists who study the subject believe that human activity is contributing to a rise in average global temperatures.